Recreate scenes from Hong Kong action cinema like Enter the Dragon, Kill Bill, Big Trouble in Little China, Crouching Tiger - Hidden Dragon, and Hard Boiled. A Fistful of Kung Fu is set in a modern world walking a precarious line between the advances of next-generation technology and the tradition and mysticism of ancient cultures. Kung Fu schools face off in no-holds barred martial arts tournaments. Evil corporations hire hitmen and infiltrators to steal each other's secrets. Overworked SWAT teams respond to street-level gunfights between feuding Triad and Yakuza clans. Ancient artefacts are sought by hopping vampires and cyborgs alike, each seeking to harness the power of the Four Dragon Kings and control the world. Bullets, punches, kicks and throwing stars fly in slow motion as martial arts heroes and gun-wielding cops defeat enemy after enemy in the pursuit of evil masterminds. Possible factions range from Chinese Triads and the Japanese Yakuza to Ninja clans, martial arts schools, the men and women of the Hong Kong Police Department, demons, secret societies and almost anything else you can imagine! All struggle for supremacy - destroying the city in the process. Mooks and supporting cast are swatted like flies, but can still be dangerous when given the advantage of numbers or automatic weaponry. 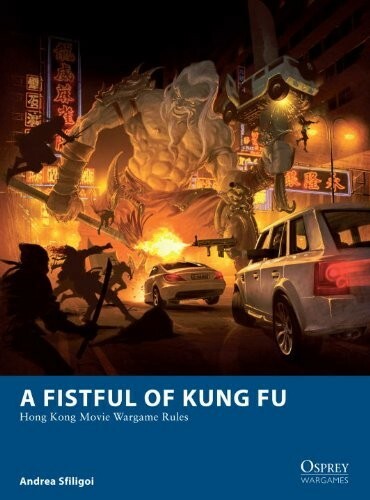 Based on the popular Ganesha Games rules system, A Fistful of Kung Fu introduces martial arts combat with manoeuvres that have different outcomes depending on the degree of success, and which allow for counter-attacks when they fail, giving a flowing, appropriate combat system. The game also includes rules for challenges and "gun-fu" stunts.